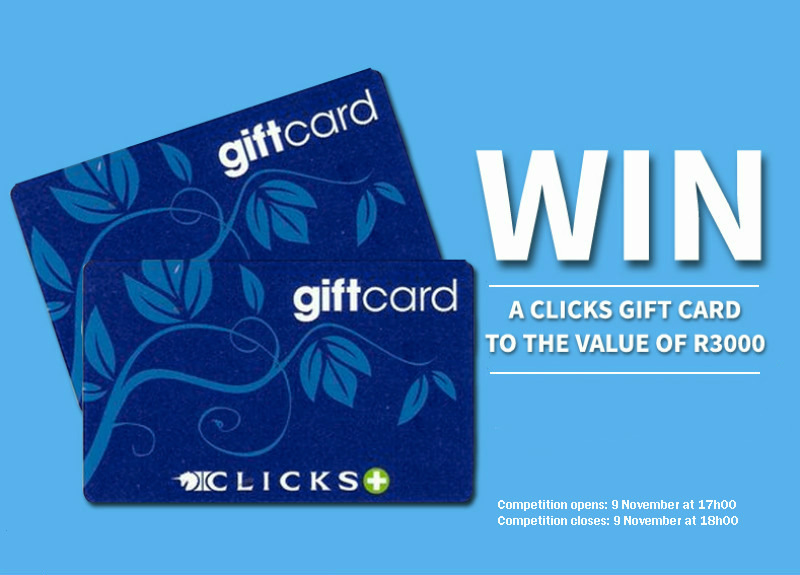 Stand a chance to win a R3000 Clicks gift voucher! 2.1. Entries for the Competition will open at 17h00 on Wednesday, 9 November 2016 and will close at 18h00 on Wednesday, 9 November 2016 (Competition Period). 5.1. We will randomly draw 1 (one) winner (Winner) by means of an automated system within 48 (forty-eight) hours from the closing date of the Competition Period. 5.3. The Winner will be required to provide a copy of his/her Identification Document as required in terms of the Consumer Protection Act, 68 of 2008. If a Winner fails to provide a copy of his/her Identification Document within 3 (three) days from it being requested, that Winner will forfeit the Prize and shall have no claim against us. 6.7. We will contact the Winner per telephone to make arrangements for delivery of the Prize, which shall be delivered to the Winner within the Republic of South Africa within 30 (thirty) days from confirming the Winner.